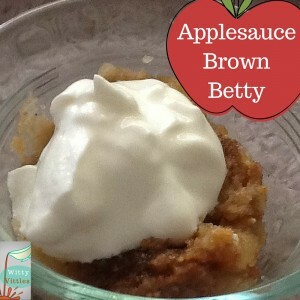 Today is National Apple Brown Betty Day! Nobody really knows how the brown Betty got its name. It’s said that it was named for the African-American slave who invented it hundreds of years ago. A recipe for the now-famous concoction was first published in Yale Literary Magazine in 1864. The original recipe used whole, fresh apples as its base, but a variation printed in the 1870s used crackers and applesauce, and this I found particularly intriguing. So I took the idea and ran with it and came up with something amazing that the whole family enjoys! This brown Betty variation was based on an 1870s version using applesauce and crackers. My whole family enjoyed it so much, they’re now asking to have it every night. Definite winner! Grease a 7 X 11 Pyrex baking dish. Put the bread in a chopper (I used my Ninja Master Prep) and chop into fine crumbs. Melt the butter in the microwave, for about 45 seconds. Layer the breadcrumbs along the bottom of the baking dish, and pour the melted butter on top. Stir the butter and crumbs together and press down into a thin crust. Sprinkle the nutmeg over the crust. Layer the applesauce over the crust and spread evenly. In the chopper or a blender (again, I used my Master Prep), combine the cinnamon, crackers, nuts, brown sugar, and wheat germ. Process until everything is well blended into fine crumbs (about two minutes). Pour out into a bowl and stir in the maple syrup and water until all the crumbs are moistened. Spoon out on top of the applesauce and spread evenly. Put the baking dish in the microwave and heat on high (Power Level 10) for 5 minutes. Remove and cover with wax paper. Put back in the microwave and cook on medium (Power Level 5) for 5 minutes. Remove from microwave and serve immediately with a dollop of Greek yogurt or whipped cream on top. The thing I really love about this is (as I discovered later) it tastes just as amazing cold as it does warm. You really can’t miss with this one! I’m glad Betty (whoever she was) made this and shared it with the rest of us. I haven’t made Apple Brown Betty in years, yummy! Thanks for sharing on Creative K Kids Tasty Tuesdays. I hope you will join us next week.